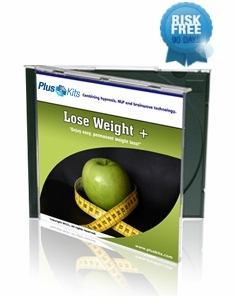 PlusKits.com - The Ultimate Weight Loss Hypnosis NLP CDs For Losing Weight. Need a way to keep the weight off for good? A method that works with your body’s metabolism from the inside out? Let Weight Loss + help you achieve your ideal weight the easy way! No more gimmicks, fads or dangerous surgical procedures. Weight Loss + uses the most advanced scientific techniques to help you control your body size safely and consistently. Through a combination of NLP, hypnosis and brainwave stimulation, Weight Loss + will have you eating healthy, thinking positive and feeling good about yourself in no time. Simply sit back and listen as the soothing musical soundscapes help you relax and rejuvenate from within. How long does it take to achieve your ideal weight? With Weight Loss +, you’ll start to feel the benefits in less than 60 minutes. Old habits will fade away as you gain confidence and a new self-respect. • Feel the admiration of others. • Enjoy the thrill of shedding that excess weight. Purchase Weight Loss + TODAY and restore your body to its optimal shape!